The importance of innovative supply chain management has been highlighted time and again by scholars and researchers for successful management of businesses in the 21st century. Most of the great businesses around the world have improved their growth rates only by adopting innovative supply chain management practices. Whether it is a retail giant, a fashion brand or an electronics company, careful management of the supply chain has become imperative to great quality products and better business performance. Nike is the largest maker of athletic footwear and apparel globally. Its successful global business model is based on successful supply chain management. Apart from great product quality and use of innovative technology as well as innovative methods and channels of marketing, the brand has maintained a strong supply chain system. The main support for its global business empire is the supply chain network. Its supply chain model has evolved a lot in this decade. The brand has grown more cautious about its environmental footprint, quality of products and customer service. Supply chain plays an important role in all the three areas. Nike has managed a smart, efficient and agile supply chain. For raw materials and manufacturing, Nike relies completely on external sources. 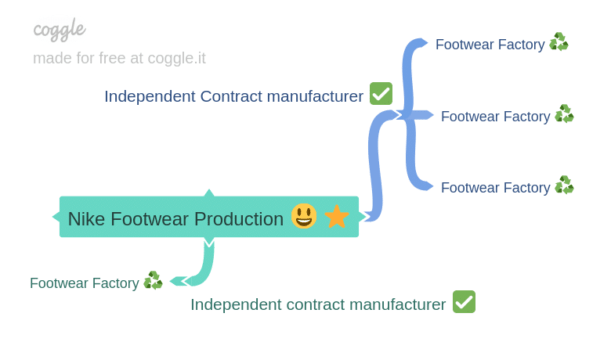 Nearly all of its products are manufactured by independent contractors. It has a broad base of suppliers that support its business and growth. However, quality is a very important concern in Nike’s supply chain. The company maintains great caution regarding the selection of raw material and its suppliers. There is a global procurement team at Nike to obtain raw materials. It takes care of the entire procurement process from selecting to contracting with the right suppliers for the right goods and services. Its strategic sourcing initiatives have also helped the brand reduce its carbon footprint. The brand is committed to purchasing sustainable raw materials. As a part of its supply chain management strategy the focus is on quality and long term agreements. In past, Nike has courted several controversies over its supply chain practices related to labor welfare. It is why, it made its focus on ethical supply chain practices stronger. Its sourcing strategy focuses on those suppliers and makes them a priority who have shown leadership in CSR and sustainability and who offer more than the minimum quality standards. Its supply chain partners have agile and resilient management systems to enable them to grow sustainably and with minimized environmental impact. The focus is on fostering a culture of safety, diversity and inclusion down the supply chain and therefore the suppliers are also judged and audited based on fair labor standards. To ensure that its suppliers follow the prescribed best practices Nike has set a code of conduct and Code Leadership standards for them. The code of conduct lays down the minimum standards that each of its suppliers factories and facilities are required to meet. It lays down several requirements chief of which are related to forced labor, child labor, excessive overtime, compensation and freedom of association. The Code leadership articulates the standards according to which the code of conduct must be implemented. It also notes how Nike measures compliance against the set standards. The expectations and standards have been continuously raised throughout these years for Nike suppliers. Apart from having established the standards for conduct for the suppliers, Nike also ensures compliance using various methods. Its suppliers are required to declare that they are sourcing materials from vendors which are Nike code of conduct compliant and comply with the local and national labor laws. Moreover, this system is evaluated and updated periodically to ensure a risk free supply chain system. Nike carries out regular audits of its supplier factories to ensure suppliers remain compliant. It uses detailed criteria for evaluation and audits. Apart from its network of suppliers, Nike has an efficient distribution system to cater to the needs of its individual customers really faster. It has established a smarter distribution and logistics network that helps with faster shipments and quicker response to customer demands. These distribution and logistics centers also serve as critical touch points serving the needs of thousands of Nike retail stores, online sales and individual customers. They add speed to the entire supply chain system. Three years ago, Nike opened its North America logistics campus in Memphis, Tennesee. It is the largest of all distribution centers Nike has opened to cater to more than 2000 Nike stores in North America. This state of art facility is set over 2.8 million square foot and holds footwear, apparel and equipment by Nike and Jordan. It has improved Nike’s ability to deliver premium products to the customers faster and more efficiently. This facility meets Nike’s highest standards of sustainability and helps cater to the increasing demands of the individual consumers and wholesale customers. The logistics center offers higher cost efficiency by reducing shipping time and increasing service capabilities. Its European logistics centers stretches across four locations in Belgium and meets its high sustainability criteria. These regional logistics campuses or distribution centers have helped Nike manage a faster and smarter supply and distribution chain. In this way, there are several outstanding things about Nike’s supply chain, the most important of them are its efficiency, focus on ethics and sustainability and large size of infrastructure.